Political figure Mufid Bey Libohova (1876-1927) was born in the southern Albanian village of Libohova, scion of a wealthy landowning family. 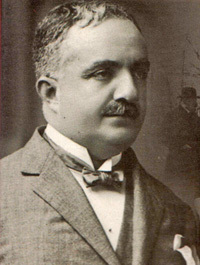 He served initially in the Ottoman administration and represented Albania in the parliament of the Young Turks in 1908. Albania had declared its independence in 1912, but after the chaos of the First World War, no unity or real national government authority was achieved until the early 1920s. At the end of the First World War, Mufid Bey (also written Myfit Bey) was among the chief promoters of a conference in Durrës that led, on 25 December 1918, to the creation of a new provisional government headed by former Prime Minister Turhan Pasha. Mufid Bey took over the ministry of the interior and justice, and later became minister of foreign affairs. In April 1919 he left Albania to take part the Paris Peace Conference and to attend to Albanian interests there. In August 1919, on his return from Paris, he stopped over in Rome. During negotiations with the Italian government, he secured Italian recognition for Albanian independence and a promise that the Italian occupation of Vlora would be temporary. It is this turbulent period of Albanian history that Mufid Bey Libohova describes in his memoirs, “Politika ime ndë Shqiperi, 1916-1920” (My Policies in Albania, 1916-1920. Mehmed Bey and I arrived in Albania to form a National Council that would be of importance and have the competencies of a government, but that would not be noticed by our neighbour’s supporters. However, when we got to Durrës and saw the amount of support there was for the creation of a Provisional Government, we were satisfied and decided to ignore any possible opposition from the Italian armed forces. 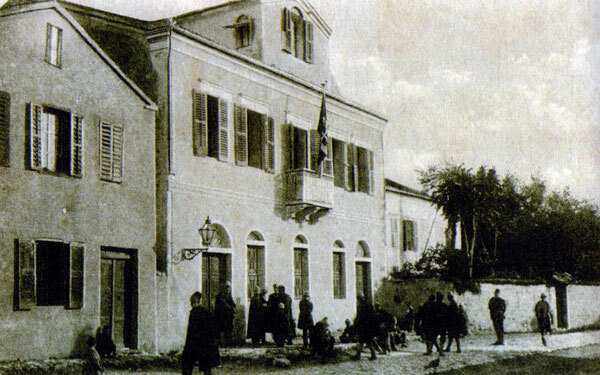 Thus, an Albanian Government was formed in Durrës in December 1918. Our main and real aim was to create a government authority throughout the country that would have the right to send a representative to the Peace Conference that was underway. I was already aware that the Italian military authorities in Albania would never allow us to act as needed without interfering in our government duties, but on the other hand, we hoped that the work of the Paris Conference would not last longer than five or six months and that during that time, the Great Powers would take a definitive decision on Albania’s fate. As such, we were willing to accept beatings and insults from the Italian military leadership. We were not disappointed or surprised by all the things that happened at our expense and to the detriment of the Nation from early 1919 to February 1920, from the time that we were forced to hand over the government to the administration that evolved out of the Congress of Lushnja. What did surprise us and what we were not able to comprehend was that the Paris Conference went on and on and found no end. As a result, aspersions were cast upon our government at home and our lack of authority and we were unable to get a number of ambitious, fortune-seeking individuals to respect the law. In the spring of 1919, when we sent our mission to the Peace Conference and when we requested that it seek support from Italy, that seemed to be our only friend at the time, to ensure at least the minimal borders of 1913 and state sovereignty, it seemed to us that the Conference was taking a turn against our interests, that America and the Allied countries would not give in on the rights they had earlier proclaimed. We should have been given Kosova and Chameria. But when Italy refused to join us to ensure the stipulations of 1913, our mission was then free to negotiate directly with our Balkan neighbours on the basis of the above-mentioned stipulations. The late Bib Dod Pasha was present at the talks we had in Durrës and he said to me that, if we wanted to reach an agreement with the Balkan countries, we should send him to Belgrade or to Paris because he knew Prime Minister Pašić personally. Our mission in Paris was not able to get any assurance from Italy and encountered no sympathy in the French capital. The special commission set up by the Conference to study Greek claims had decided to rectify the Greek border with lower Albania to our disadvantage. America was the first to hand over virtually all of Northern Epirus to Greece. Italy was the only opposing power in the spoliation. Two telegrams, one from Turhan Pasha and the other from Sonnino gave us our mandate. Korça and Gjirokastra were at death’s door. But Italy was not particularly inclined to do anything to save us. I was terrified. I travelled to Gjirokastra to organise a meeting at which we would try to gather funds for armed resistance. When I passed through Vlora on my way to Gjirokastra, I spoke to several high-ranking Italians and came up with the idea of a special regime for Gjirokastra and Korça that would provide some satisfaction to the Christians there. The meeting in Gjirokastra was held on 20 March and was attended by representatives of Gjirokastra, Delvina, Përmet, Erseka and Leskovik. 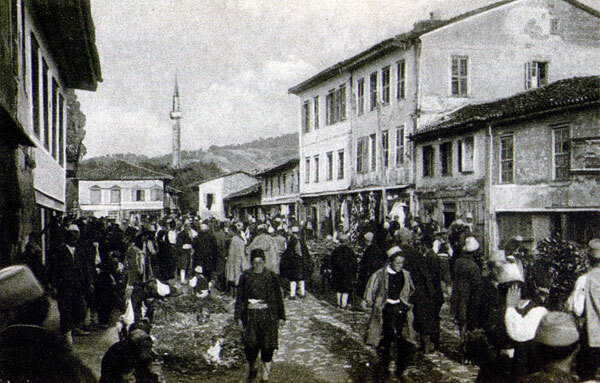 Korça was still under French occupation and was thus unable to send a delegate. As such, Korça was not represented at all at the meeting. Pour éviter des dissidences et des mésintelligences parmi les éléments chrétiens et musulmans de l’Albanie Méridionale et pour faciliter la tâche de nos défenseurs au sein de la conférence, nous avons jugé opportun de donner des assurances à nos frères orthodoxes qui pourraient se considérer insuffisamment protégés contre la majorité mahométane malgré la charte constitutionnelle qui sortira de la conférence pour l'Albanie. Nous admettrions par conséquent volontiers qu'un système administratif répondant aux exigences de la situation soit octroyé à l’Albanie Méridionale et que ce système soit placé sous la garantie et la protection de l’Italie sans toucher à l’indépendance et à l’unité de l’Albanie. signés: Mehmed Ali Pasha, Alush Taka, Namik Delvina, Omer Abas, Javer -, Rauf Fico, Xhelal Dobi, H. Hoxha, Papa Pano, Naim Xhango, Mehmed Karagjozi, Polo Meksi, George Meksi, Avni Dabulla, Burhan Kumbaro, Suleiman Bogdo, Vassil Kalluçi, Stavro Xhaho, Mufti Hilmi Dervish, Mufti Lutfi, Vangjel Tasho, Qemal Përmet, Islam Muhtar. I telegraphed this order, given to me at the meeting, to Turhan Pasha, and added: “I would ask Your Excellency to collaborate with the Minister of Foreign Affairs of the friendly Power for the implementation of the above matter." Fortunately for Albania, the issue of Greece's expansion to our detriment was not raised any further and the above-mentioned telegram was simply filed in the archives of Turhan Pasha. As such, we had tried to save Korça and Gjirokastra from Greek annexation. But when the representatives of the Epirotes in Paris heard what we had done in Gjirokastra, they protested at the Peace Conference against me personally, claiming that I wanted to force the Christians to sign a petition for the Peace Conference against their will to demand the union of Epirus with Albania as an Italian protectorate. The Albanians who criticized me for the Gjirokastra meeting learned, I hope, that the so-called Epirots were nervous about what happened in Paris, i.e. that Gjirokastra and Korça might remain with us as we wished. When the representative of our colonies in Istanbul went to Paris, our delegates split into two camps. Mehmed Bey Konitza and Turtulli Bey left their colleagues and joined the Istanbul delegates. They refused to collaborate with the official Albanian delegation under Turhan Pasha and stated that they saw the salvation of Albania in the opposition that we would raise to the Italian Government, opposition that would win us the sympathy of the Allies, of America and the Balkan countries. Our colleagues who continued to Turhan Pasha, such as Monsignor Bumçi, Gurakuqi, and Mustafa Kruja, stated that without hope of support from the Balkan countries or from the Great Powers, it would not be a good idea to annoy any country, and that we should concentrate on justice, i.e. on seeking independence and territorial integrity, that is to say that we should remain neutral, not be on one side or the other. This was the important thing for the Albanian politicians of both groups in Paris. With such a state of confusion in Paris, and Albania giving the world the impression that it was hopelessly divided, the newspapers were claiming that we did not even know how many delegations we had and which one was the real Albanian delegation. The Durrës Government decided to send Mehdi Bey Frashëri and me to the French capital to clear the matter up and to give our official support, on behalf of Albania, to the group that we regarded as right. A resolution issued in Durrës on 17 April 1919 and signed by Sami Bey Vrioni, Mr Poga, Fejzi Bey Alizoti, Mustafa Kruja, Mehdi Bey and myself gave us authority not only to regulate the issue of the two opposing groups but also to sign treaties or agreements with any country or group of countries, with the exception of a treaty that would do damage to Albania’s international reputation as an independent and sovereign state. When Mehdi Bey and I got to Paris, we were shocked to see that the dispute between the Albanians there had surpassed all limits and that rumour were being spread about the group under the leadership of Turhan Pasha that tarnished the reputation of the whole Albanian Government. Firstly, we questioned Turhan Pasha’s group about the state of Albania’s affairs. They told us what had taken place and of the difficulties they were faced with. We then asked the other group if they had any concrete ideas as to how we could get away from Italy and pursue Balkan policies. These fellows ensured us that they had confidence in the friendship of our neighbours and our protectors, but that we must distance ourselves from Italy. Mehdi Bey and I then said that if Italy would not even guarantee the stipulations of 1913 and if the Balkan powers would renounce their claims over Albania from 1915, we would be willing to disavow Turhan Pasha’s group and work with them. But aside from mere words, the dissident group was not able to come up with any proof to convince us that hostility towards Italy would win the sympathy of the Great Powers and cause the Balkan countries to renounce their claims and recognise the territorial integrity of Albania. We were at a loss and did not know what to do because, aside from exuberant words, Italy was not giving us any assurance that it supported the Albania of 1913. I then wanted to make an attempt with Serbia by means of Essad Pasha. I had tried this several time, but aside from words, he was not able to come to terms with the Serbs. Essad Pasha wanted us first to recognise him a head of the government and thus, by giving our full confidence to the Serbs, he would be able to come to terms with them. Knowing how the Balkan countries were thinking, seeing great reticence on the part of England and France, and hearing officially of the gift of Vlora that President Wilsom made to the Italian Government in order to get Fiume for Yugoslavia, we could not in good conscience ally ourselves with our neighbours and declare war on this diplomacy. One day in Paris, I went with Mehmed Bey to meet an Englishman who was very well-respected and who was a true friend of Albania. This Englishman told Mehmed Bey that the Albanians ought not to take sides, but should follow the course of justice. The Prime Minister of Romania, Bratiano, gave me the same advice. This gentleman, whom one could call a good friend of Albania, told me a number of other things that I do not wish to publish here. After a two months’ stay in Paris, Mehdi Bey and I decided not to accept the policies of the dissident group. As the opposition had spread many unpleasant rumours about Turhan Pasha, we resolved to sacrifice the innocent old man and place in his stead, as head of the delegation, Monsignor Bumçi, a very skilled clergyman, well respected and known for ages as not being an ardent supporter of Italy. We then discussed the programme to be promoted by the delegation remaining under the leadership of Monsignor Bumçi. We decided that our mission should not betray any hostility towards Italy or the Balkan countries. We were to adhere to the principle of justice, and demand of the world community independence and territorial integrity for Albania in line with the stipulations of 1913. As Dr Turtulli and Mehmed Bey insisted on their views and refused to submit to the majority decision, they withdrew from the official delegation. As to the representatives of the Albanian colony in Istanbul, Mr Shani and the priest Bonatti went to Istanbul, as did Halil Pasha Alizoti and Fuat bey Zemberaku, where the joined the group of Dr Turtulli and Mehmed Bey Konica. Sulejman Bey Delvina, who had arrived from the Istanbul Club to mediate in the dispute among the Albanians in Paris, joined this group, too. As such, until recently, Albania has indeed had two delegations in Paris, one official mission and another semi-official mission. From the moment it went to Paris right to the end of its mission, the Government Delegation did nothing but insist on the independence and territorial integrity of Albania. As to the Vlora issue, my colleagues working in Paris had been protesting sharply for months. They had fulfilled their patriotic duties with zeal and clarity, and I am honoured to have worked with such wise and eminent patriots. With regards to our activities in Paris, this exposé endeavours to shed light on those Albanians seeking the truth and not striving simply for political advantage. On the one hand, peace and security in Albania had begun to disintegrate due to the weakness of the government and to the incompetence of the carabinieri who in theory were supposed to be helping out the gendarmes. On the other hand, it was evident that the Paris Conference was going to leave a decision on the Albanian question to the end and that we would remain a sort of phantom government. The Italian military command in Albania, as I noted above, had reduced us to a skeleton and we could resist no longer. When I left Paris for Albania, we decided to submit to the control of the Italian command over the country until the Conference took a decision on the definitive status of Albania. With regard to this control, we had talked to the Italians on many occasions, but had not reached an agreement that would satisfy the two parties because we wanted free rule and the Italians replied that as long as there was military rule in Albania, they could not effectively relinquish all controls over us. When I returned to Rome from Paris, I met Fejzi Bey Alizoti who was waiting for me there. He and I discussed matters with the representative of the consulate and we drafted the administrative accord of August 1919. Everyone approved of this accord, both those who had remained in Durrës and those in Paris. The accord was to be valid for a transitional period, i.e. until the Conference had come to a decision on the status of Albania. It was an Albanian administration under Italian supervision, and nothing else. The Italians would not give us rule over Vlora, insisting that Vlora was a strategic place forte and that Italy had still not signed the peace agreement. As such, Italy recognised Vlora as being Albanian territory, but for military reasons, Vlora was still a place forte and Italy retained the right of civilian administration over it. So as not to be deprived of our rights in the accord we signed, we asked for Vlora, too, and our Italian counterparts agreed that the administration of Vlora would have a straightforward Albanian character. I am giving below a word-for-word rendition of Article 8 of the accord, on Vlora. Art. VIII. I delegati Albanesi hanno espresso loro punto di vista che anche il territorio del campo trincerato di Valona dipenda in via amministrativa dal governo provisorio Albanese e che il Comando Militare Italiano vi abbia soltanto dei diritti di curratere militare e il mantenimento della sigurezza e dell’ordine publicco. L’alto commissario Italiano in Albania per facilitare le relazioni fra le locali autorità Albanesi avrà un suo representante. I delegati Italiani nell’articolo II hanno gia ammesso che l’amministrazione dell’campo trincerato di Valona deve avere carrattere prettamente Albanese e hanno preso nota dei desideri sui espressi per rapportarli a chi di dovere. Let us now turn to the word “commissioner,” the term for the Italian representation in Albania. Austria had declared officially that it would only be willing to grant Albania administrative autonomy when the population had proven that it was mature enough to make use of such a right, and then gave Greece (King Constantine) all of Toskeria up to the Shkumbin River, and gave Bulgaria all of Kosovo. When we signed this accord with Italy and approved the title “commissioner,” those men who had earlier been grovelling at the feet of the Emperor were outraged and accused us of treachery. The word “commissioner,” like many other terms, was in fashion at that time, without having the connotations that those ardent patriots and skilled diplomats gave it in Albania, because the representatives of Turkey and Bulgaria had been granted that title, and the representatives of the Allies in Berlin and Vienna have been using it up to the present day. Even the American representative in Berlin still uses this title. For us and the Italians, it had no particular significance. Proof of this is the title accorded by the Royal Government to the Albanian representative in Rome as “Albanian Commissioner.” We the ministers and my brother, Eqrem Bey Libohova, did not particularly like the term because it reminded us of police commissioners so, after discussions with the Albanian mission, we decided on the word “representative.” Those who were with the Austrian General Franz Baltin were very sensitive to General Piacentini. Despite the accord we signed with Italy, we reached the end of our strength when we took over Gjirokastra and began to administer the rest of the sandjak. Unfortunately many parts of upper Albania gave us no revenue and when we endeavoured to impose on them a little, we needed Italian support to do so. Many nationalist figures of the present had personal ties with Italian personnel. Numerous regions of upper Albania informed us that they would not finance us because we were a government without a king, and other such nonsense. I could write at length on such matters, but for the moment, for the sake of the nation, I believe it is better to keep silent about them.